The FBI and Bureau of Alcohol, Tobacco, Firearms and Explosives assisted police with a massive home raid in a quiet Virginia neighborhood, startling neighbors who woke up to flashing police lights early Friday morning. The ordeal began about 5 a.m. at a home off of Appletree Drive Northeast in Leesburg, neighbors said. They described an intense scene where police shined spotlights into the home to ensure no one escaped while several people filed out of the home with their hands up. "It was like 'Straight Outta Compton,'" one neighbor said. "It's just like the movie, like, literally." 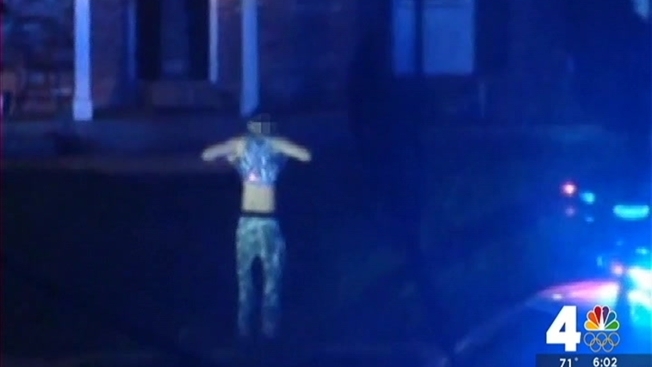 The adults in the home were forced to raise their shirts as they exited so police could check for weapons. "It was extremely scary only because we were not expecting such a thing," said Zee Ahmed, who has lived across the street from the home for 10 years. "This was a very friendly, family-oriented neighborhood." Some people from the home were detained at the time of the raid, and police are interviewing "several subjects," according to Leesburg Police Lt. Jeff Dube. A crime scene vehicle packed with evidence remained outside the home hours after the investigation began, but police have yet to reveal for what they were searching, though the raid involved members of the police gang unit. Around the home, heavily armed police and federal agents in tactical gear kept an eye on the neighborhood for those who might approach the home. Details about the case remain sparse, because police "don't want to jeopardize the ongoing nature of this investigation," Dube said. Appletree Drive was blocked Friday evening. Ahmed told News4 the mother who lives in the home is a sweet person, but she didn't recognize the others escorted out.